The supermarkets said that grocery prices would fall in both chains as a result of the merger. 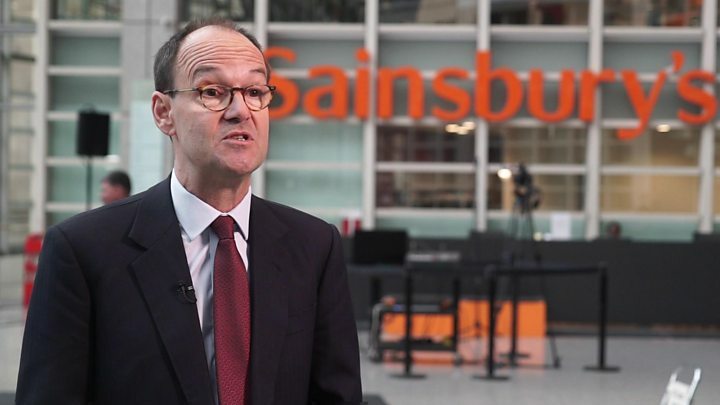 Sainsbury's chief executive Mike Coupe also said the deal would not lead to store closures or job losses in stores. The combination of the UK's second and third largest supermarkets would create a giant, representing nearly £1 in every £3 spent on groceries. Mr Coupe - who will lead the new combined group - said he believed the two supermarkets were "the best possible fit". Shares in Sainsbury's jumped 15% in response to the merger news. Jack: Sainsbury's-Asda merger - one company, two prices? Walmart, which has owned Asda since 1999, will retain 42% of the combined business. What will the merger mean for shoppers? The supermarkets say that as a result of the merger, they expect to be able to lower prices "by around 10% on many of the products customers buy regularly". Sainsbury's and Asda will remain separate brands and no stores will close, Mr Coupe told the BBC. "There's been a bit of commentary over the weekend where people have been alluding to the fact that the only way of making this happen is by closing stores - that is not true," said Mr Coupe. Following the merger Argos will open outlets within Asda stores, the firms said. Sainsbury's took over Argos in 2016 and has been integrating the catalogue retailer into its own stores. Sainsbury's said it couldn't comment on what would happen to customers' Nectar points after the merger. What will it mean for suppliers? The combined business will overtake current market leader Tesco, representing around 30% of UK grocery sales. That will give it greater muscle in the market. Labour's shadow business secretary Rebecca Long-Bailey told the BBC she was concerned at the impact on suppliers of the proposed tie-up. The combined group "will have immense purchasing power, giving them an opportunity to bargain very hard with suppliers," she warned. Mike Cherry, national chairman of the Federation of Small Businesses, said the firms should explain how they plan to merge their supply chains fairly, and reassure people that cost savings wouldn't be achieved "simply by milking their small suppliers for all they're worth". Sainsbury's and Asda executives said one advantage of the merger would be the opportunity to bring in "the power of Walmart in the form of buying of general merchandise and in the form of their systems and investments". Will the merger be allowed? A competition probe seems inevitable given the size of the two chains and the UK's competition watchdog, the Competition and Markets Authority (CMA), said on Monday it was "likely" to review the merger. Sainsbury's and Asda have asked for the CMA investigation to be fast-tracked and hope to complete the deal by the autumn of 2019. At the weekend, Liberal Democrat leader Sir Vince Cable said the merger risked creating "even more concentrated local monopolies" and said the CMA should force the companies to sell off stores if the new giant was dominant in a particular area. Retail analyst Nick Bubb said he thought there was "a pretty good chance" that the deal will be allowed to proceed, but the main debate would be over how many stores Sainsbury's and Asda would have to sell "to placate the CMA". 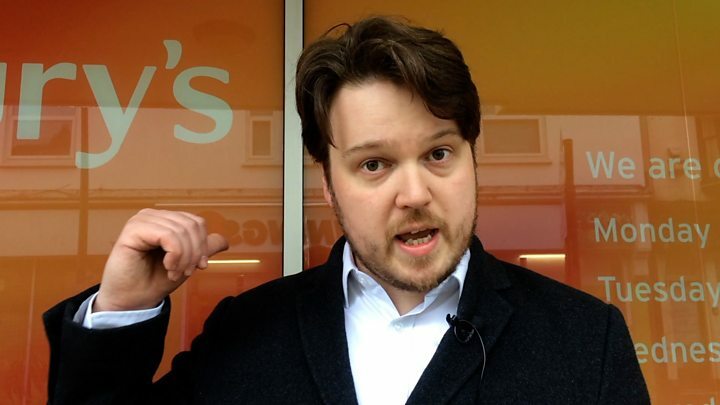 "Too many store disposals and the deal won't be worth doing... too few store disposals and the CMA will look toothless… hopefully there will be a "Goldilocks" scenario for Sainsbury's/Asda." Why are the two chains combining? Sainsbury's and Asda are both being buffeted by competition from budget supermarkets such as Aldi and Lidl. On the horizon, Amazon is making initial steps into grocery deliveries. "I think from a market share perspective, both Sainsbury's and Asda are landlocked to a certain extent. They're not really able to grow at a rapid rate," said Steve Dresser, director of the Grocery Insight consultancy. "If they remain on their own it's difficult to see how they get any real growth beyond standard organic growth, which isn't necessarily going to be enough when Amazon joins the market," said Mr Dresser. The two chains are in many ways complementary: Sainsbury's stores are focused more in the south of the UK and target a higher-end market segment. Asda is more concentrated in the north, offering lower-cost groceries. Even after reducing prices for customers, Mike Coupe thinks synergies will generate £500m of extra savings, in part through taking advantage of Walmart's clout with suppliers. As for Walmart they will receive £3bn as well as their 42% stake in the company. But the deal also offers Walmart the option of exiting the UK market altogether in four years' time. Will 'bigger is better' approach work for Sainsbury's?